Students be creative writings stories using StoryBird. StoryBird came up with a great way for students to digitally write and express themselves. They already have hundreds of works of art that are themed so students have a lot to choose from. Students can write their stories in many different categories and then digitally publish them so that others can view and read their thoughts and ideas. An example of a StoryBird book is provided below. Also there is a tutorial on how to use StoryBird. 1. Go to www.storybird.com and click the "Create" button. 2. Your students will now choose a theme to work with. There are many to choose from. All you need to do is click on one of the pictures on the right hand side. If you want to browse for more, just click the refresh button in your browser and a whole new set of images will appear. 3. Decide what you are going to write; either a story or a poem. Click on your preference. 4. You will now be taken to a screen that has pictures relating to the theme that you chose in step 2. Just drag the images you want onto your story book in the middle of the screen. 5. As you are dragging the image onto the page you will see it highlight in different locations. Where ever you place your image will decide where you get to write. As you can see from the image below, if I drop the image there, it will be on the left hand side and I will be able to write on the right hand side. Try dragging the image around until you find the best placement for your story. 6. Now just write the first part of your story into the text box. 7. Over to the right hand side you will see a "+" sign. Click it to add another page to your story. 7. At the bottom of the screen you will see your story unfold. 8. When you are ready to design a cover just click on the "Cover" page from your page layout. 9. Choose the cover style that you would like to have. 10. Choose the colored background for your text. 11. Type your title and author into the appropriate boxes. 12. When you are ready to share and publish your book, just click the "Menu" button from the bottom left of your screen and then choose the "Publish" option. 13. Here you can change your title and add a summary for your book. 14. Choose the age group your story is most likely to belong to. Decide whether you want it public for all to see or just keep it private. When you are done just click the "Publish" button. Post announcements and news on your classroom Google Site. Keeping your classroom site up to date is key if you want your students and parents to actually use it as a means of communication between you and them. One of the neat trick with Google sites is the creation of a news feed that you can place into your site so that your students can see new and important notices quickly. 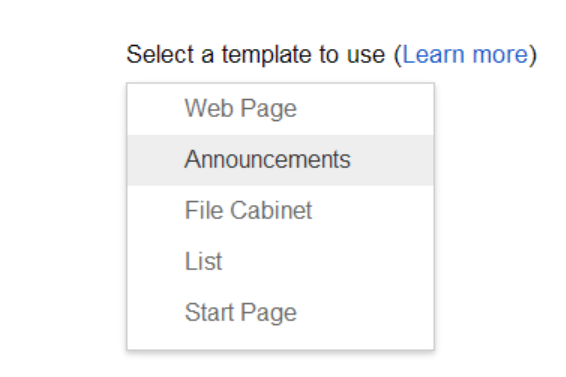 The tutorial below demonstrates how to create, post and delete announcements from within a Google Site. 1. Log into your Google account and navigate to your classroom website. 2. Create a new page by clicking the "New page" icon. 3. Give your page a title. In my case I just call it news and let my students know that is where all my announcements will be shown. 4. Click on the type of template you want to use. Choose the "Announcements" template. 5. Select where you want your page when it comes to navigation. Either the top level or home works just fine. 6. Now just click the "Create" button. 7. This will now take you directly to the new page you created. To add a post just click the "New post" button. You can also see that your students can also subscribe to your news announcements. 8. Give you new post a title. 9. Give some detail to your post. 10. Notice at the bottom you can also click the "Add files" button which will allow you to upload documents such as homework sheets or study guides. TIP: If you plan on adding files, make sure you either save your post first, or add the files first because if you type in your title and details without saving and then click the "Add files" button, it will refresh the page and not keep the info that you have already typed. I learned this tip the hard way, more than once. 11. Make sure you hit the "Save" button and you now have your new post. 12. So far you have just created a post. We now need to add a place where your students can have easy access to the information. So now we are going back to the Home page and add a section for you news postings to show up. Click on the "Edit" icon so that you can get your edit tools. 13. Click on the "Insert" from the menu bar and then choose the "Recent Post" option. 14. Click the drop down menu to see which pages you can pull announcements from. Choose the one we just created. 15. Decide how much and how many of the posts you want displayed. 16. Add a title and then click the "Save" button. 17. Your post is now visible on your home page. 18. Now keeping your news up to date is key to being successful. Your students and parents will appreciate it. So that means you don't just create new news but also delete old irrelevant news. The following instructions demonstrate how to delete postings. Just click on the news item you want to delete. This will take you to the place where you can edit or delete your news. 19. Click on the "More" button at the top. 20. You should now see a "Delete" page option. As long as you are on the post's page and NOT on your news page which will show all of your posts, clicking the "Delete page" option will just remove that post. 22. Now when you hover your mouse over the navigation bars you will see that you can edit them. Just click on one of your navigation bars. 23. You should now see a list of all of the pages and links found on that bar. Click the "Add page" link. 24. Navigate to the page you want to add to your navigation bar. In this case I select the "News" page and then will click the "OK" button. 25. Then click the "OK" button on the next screen as well. 26. You should now see the page added to your links. When you want to add a new post and start all over, just click your "recent announcements" link which will take you to the page where you can add new announcements. SlateBox is another online solution to your student brainstorming and research projects. This is extremely easy to use and in moments you can have a complete concept map that can be embedded and downloaded as an image. Even though the program is great, there are a few glitches. For some reason when I try to export the image, some of the embedded images refused to show up. Also I couldn't get the embed code to work properly. If you have any luck with it, let me know. Inside the program though it works flawlessly. I should also note that I couldn't get it to work with Google Chrome, but that may be because of the newest update in Chrome. It works great though with Internet explorer. 1. Once you go to www.slatebox.com just click the "Try now" button. 2. Click the "New Slate" highlighted link to get going. 3. Give your slate a name and description, then click the "create" button. 4. Hover over your first "Node" and you will see three icons appear. The gear shaped icon is your "Node's" setting button. The right arrow will duplicate the node. The bottom arrow will create a new attached child node. 5. Double click on the "node" to open up the window that allows you to edit your node name, size and color. 6. Lets start by clicking on the Gear icon. You will now get a series of options. You should play with them all to familiarize yourself with them. You can see that you can change the font color and shape of your "nodes." You can add links, embed images in your nodes and draw lines from one node to another within the settings box. 7. Once you are done you can go to the top of the screen, where you can create a new one, try embedding your image, export it as an image (you will need to manually add the .png string. 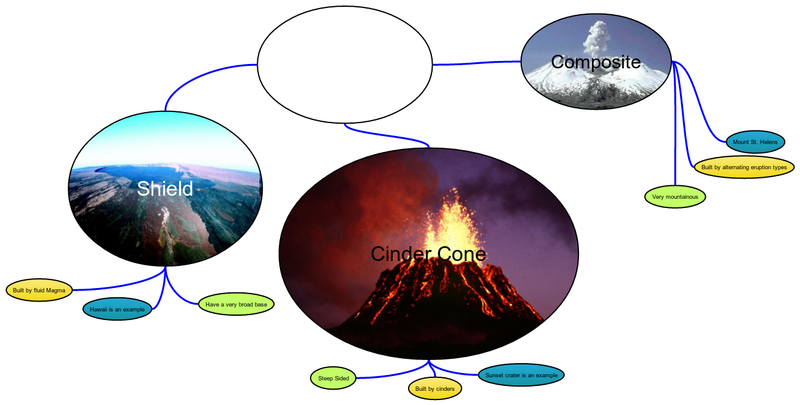 ), and change the properties such as the name and description of your concept map.